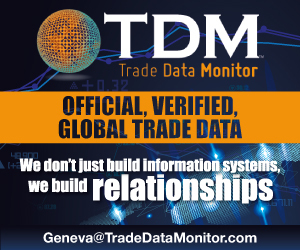 Are there reasons to fear a slowdown in trade? In Italy, the food industry world is concerned about the consequences and risks of a possible hard Brexit for the "Belpaese ". Indeed, according to the CIA (Confederazione Italiana Agricoltori – the Italian Confederation of Farmers), Italian exports of food and drink to the United Kingdom amount to more than EUR 3.3 billion, representing a major input for the Italian economy. Prosecco and wines in general, fresh and processed fruit and vegetables, as well as cheeses and delicatessen meat products like salami would be among the most threatened market segments of the "made in Italy" food industry in the event of a "hard Brexit". After the massive rejection by the House of Commons of the agreement concluded by Prime Minister Theresa May last November with Brussels regarding the divorce from the EU (432 against and 202 in favor), the Italian agricultural world is worried about the negative consequences that a "no deal" outcome could provoke. For Italian political leaders, the country's food industry could be heavily impacted, if not ruined. According to the Confindustria Association representing companies from all Italian market sectors, annual exports are said to reach an overall total of approximately EUR 23 billion. "The agreement drawn up between Europe and the United Kingdom, after more than two years of negotiations, offers major guaranties to the economic sectors and to civil society – declared Dino Scanavino, national president of the CIA – and the collapse of that agreement would create a situation of uncertainty, both for companies and for citizens, which is all the more worrying given the current context of major difficulties in terms of international trade and economic growth, both at the European level and internationally." Both the Coldiretti and the Confagricoltura have drawn attention to the negative effects that could arise from the current situation of blockage. 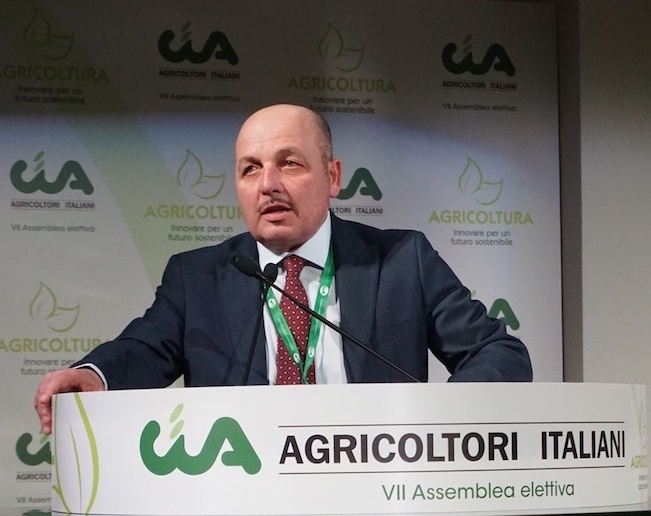 In a hard-hitting statement, Confagricoltura President Massimiliano Giansanti, warned of the fact that "a withdrawal of the United Kingdom without a deal is the worst possible scenario for Italian agriculture. In fact, after 30 March, we will notice a sharp slowdown in the flow of food exports shipped to the British market." The Confagricoltura has asked the Ministry of Agricultural Policy to activate a work group in charge of identifying appropriate measures to be undertaken in support of the sector. On a political level, the designated EU negotiator for Brexit, Michel Barnier, made reference on 22 January to "the best possible compromise", clearly suggesting that no further negotiations would be undertaken with London. On the same topic, Paolo De Castro, first vice-President of the Agricultural Commission of the European Parliament added that "The European Parliament is not willing to open a second round of negotiations in this divorce procedure between the EU and the British government, except for the purpose of improving the current agreement for European citizens, farmers and the food industry chain as a whole." 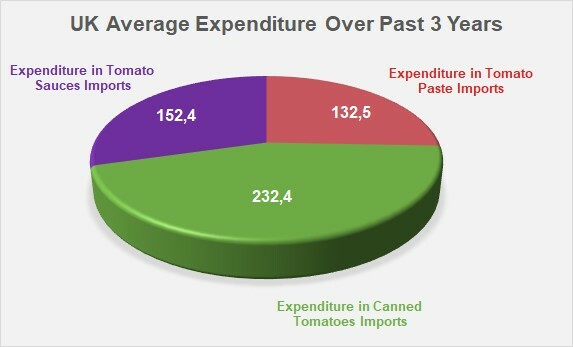 UK expenditure for its supplies of tomato paste progressed fairly regularly over the past two decades, before stabilizing around an average of slightly more than EUR 517 million. It is mostly focused on imports of canned tomatoes (approximately EUR 232 million, or 45% of expenditure over the past three marketing years (2015/2016, 2016/2017 and 2017/2018)) and, to a lesser extent, of sauces (EUR 152 million, or 29% of expenditure over the period considered) and tomato pastes (EUR 133 million, or approximately one quarter of total expenditure). The first and almost only supply source for the British market is the European Union: over the past three marketing years, EU countries have accounted for 85% of the United Kingdom's total supplies of tomato pastes (157 000 mT per year, approximately), 99% of its supplies of canned tomatoes (321 000 mT) and 92% of its sauces (166 000 mT). 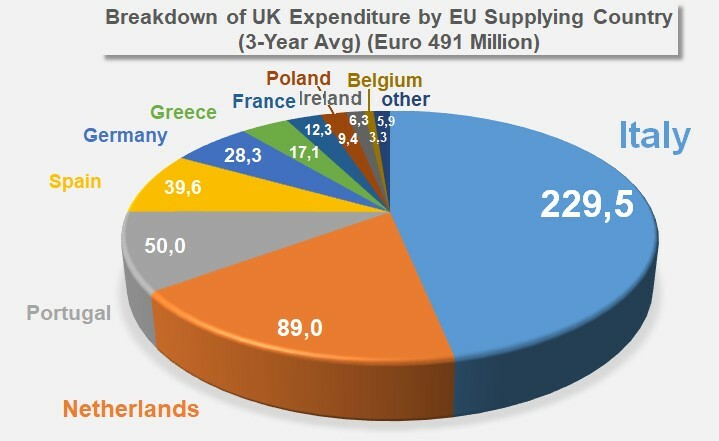 In return, the proportion of British expenditure going to European suppliers of these different product sectors has been practically proportional to the volumes delivered, with a total of 95% of UK expenditure on tomato products paid to companies within the Community (slightly more than EUR 419 million per year). 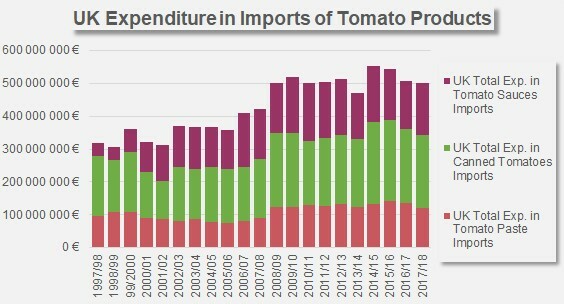 In a detailed breakdown, Italy has claimed on average over the past three marketing years slightly less than 47% of British expenditure on tomato products, which amounts to about EUR 230 million. 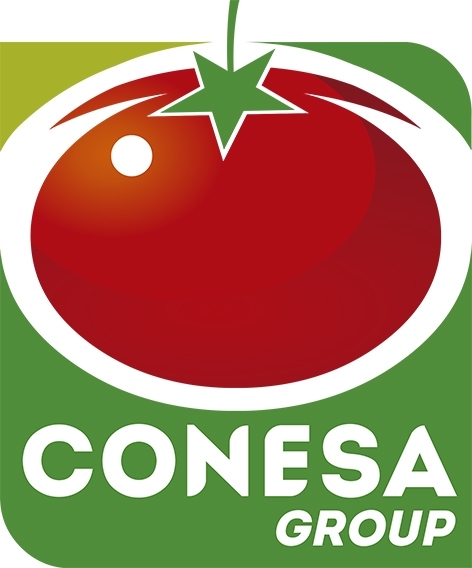 The Italian industry has sold on average each year slightly less than EUR 160 million worth of canned tomatoes over this period of time, which accounted for 71% of the amount absorbed by Italy – with pastes and sauces respectively generating an average of 18% and 11% of Italy's annual turnover. 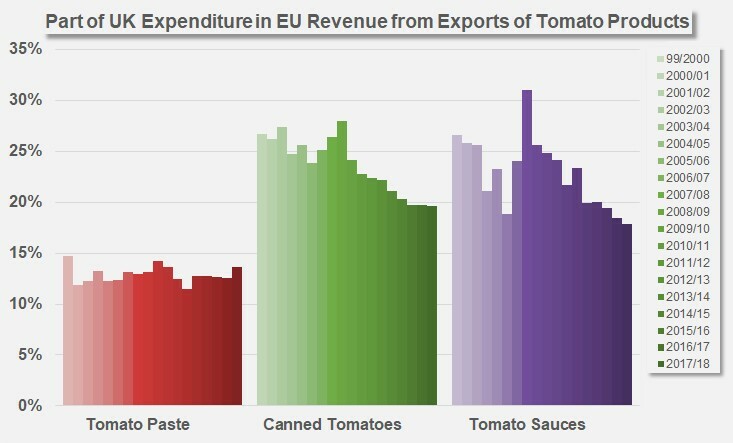 Given the scale of British sauce purchases from Italy, it is not surprising that the Netherlands, which account for 18% of UK expenditure on tomato products, feature in second place among suppliers to Britain, ranking higher than European leaders of first stage processing operations. Although Netherlands products have been slowing down, mainly due to increasing competition from products made in Italy, Portugal and Germany, they have accounted for close on 57% of the volumes of sauces imported onto this market over the past three marketing years. Sauce manufacturers have delivered approximately 94 000 mT of tomato sauces to the UK each year, for an amount of close on EUR 81 million (91% of the Dutch turnover on this market, with the remainder mainly coming from sales of canned tomatoes (8% of the total)). By claiming 10% of British expenditure, Portugal ranks third among European suppliers of tomato products for the United Kingdom. Unlike operators in the two previous countries, operators of the Portuguese industry have based their relationship with the UK market on supplies of pastes: average annual exports over the past three marketing years involved slightly less than 38 000 mT of pastes and generated a turnover slightly in excess of EUR 30 million. Over this period of time, the paste sector alone has accounted for more than 60% of total Portuguese results (EUR 50 million annually) on the British market, with pastes accounting for 21% (EUR 10.5 million) and sauces approximately 19% (EUR 9.3 million). Spain is the fourth biggest supply source, and mostly sells pastes to the UK, in direct competition with Italy and Portugal. With 31 000 mT per marketing year and a trade flow pattern that is currently increasing, this sector has accounted for close on two thirds of the total Spanish turnover (about EUR 40 million on average) from the British market over the past three marketing years. The desire of the Spanish industry to develop a "canned tomato" segment has led to sales of 24 000 mT of products per year on the British market, for an average turnover of close on EUR 10 million over the past three marketing years, which is about one quarter of the total result. Spanish tomato sauces (6 700 mT on average over the period considered) only accounted for about 4% of the United Kingdom's sauce supplies over the past three marketing years. Germany (EUR 28.3 million each year on average over the past three marketing years), Greece (EUR 17.1 million over the same period), France (EUR 12.3 million) and Poland (EUR 9.4 million) also have a role to play on the British market. Overall, these eight countries have accounted for almost all (98%) of European exports of tomato products towards the United Kingdom over the past 20 marketing years. The British market is almost entirely dependent on the EU; it is the second biggest purchasing region in the world, with a farm weight equivalent of almost 2 million tonnes of imported shipments. 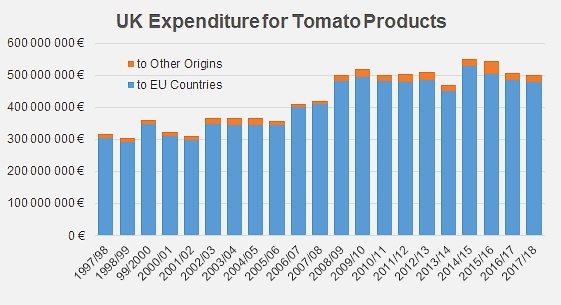 The commercial value of these products has been estimated at EUR 517 million, but the United Kingdom represents a shrinking proportion of the foreign trade of EU tomato processing countries (as new outlets are increasingly developed), whilst remaining a major market for these same operators of Europe's first-stage processing and remanufacturing sectors. 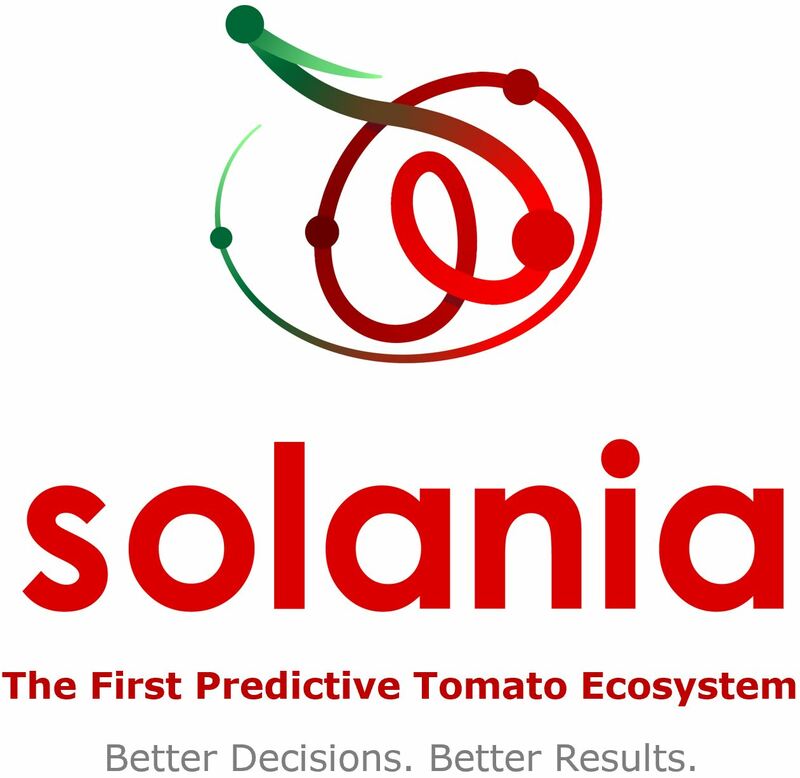 It is a fact that in 20 years, the turnover generated by tomatoes for Europe's biggest exporting countries as they sell to the British market has grown from EUR 248 million to close on EUR 485 million. But the proportion stemming from sales to the United Kingdom of total export operations carried out by the main European producers of tomato products has also fallen from close on 21% to less than 17%. In other words, the importance of Britain as a trade outlet for EU countries (Italy, Portugal, Spain, Greece, the Netherlands, Germany, Poland, Belgium, etc.) is so high that maintaining current trade flows is of a virtually vital importance for European companies that export to the United Kingdom under their own-name brands, or, as is often the case, under private labels. Over the past 20 marketing years, sector relationships between European suppliers and the United Kingdom have evolved differently, depending on the type of product considered. From 1999/2000 to 2017/2018, British purchases of European pastes (from 130 000 mT to 193 000 mT) grew practically at the same rate as European exports in this sector as a whole, meaning that the proportion for which the United Kingdom accounts in this sector has remained practically stable at approximately 13 to 14% of overall European trade. 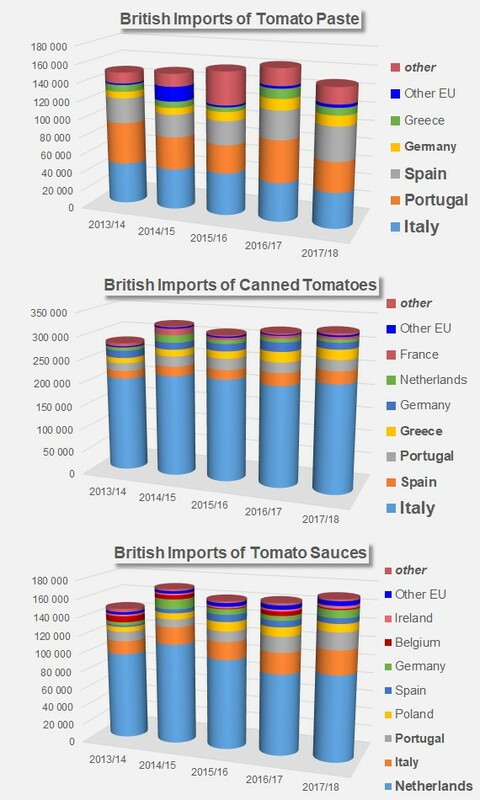 In the case of canned tomatoes, European sales to the United Kingdom (from 260 000 mT to 320 000 mT) have increased far slower than exports overall: the British share has undergone a de facto decrease, from 28% of the total in 1999/2000 to 20% last year. Finally, the dynamics that have been driving the trade of tomato sauces between EU producing countries and the United Kingdom for the past 20 years are similar to those of the canned tomato sector, with volumes that have noticeably increased (from 53 000 mT in 1999/2000 to 150 000 mT in 2017/2018), in a context that has seen an extension of European outlets that has progressively reduced the proportional weight of the British market from close on 24% of the total to 22% last marketing year. 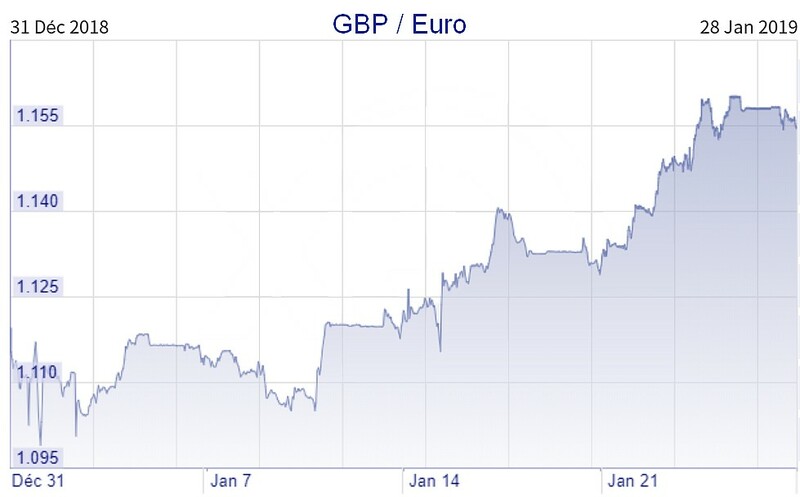 In the unclear political and economic context that has prevailed in recent weeks around the exit of the United Kingdom from the EU, one of the key parameters for the future of supply flows towards this country is to be found in the evolution of the exchange rate between the pound sterling and the euro, as well as the US dollar. In the second fortnight of January, only 10 weeks from the expected exit of the UK from the European Union (29 March), and a few days before the decisive vote in Parliament on the agreements reached after negotiations with the EU, British leaders are looking for a way to avoid the world's fifth largest economy from breaking away without any agreement. Such a hard Brexit could lead to a risk of shortages, major transport blockages around ports and a collapse of the national currency. On 24 January, the House of Commons rejected the proposed exit agreement presented by Theresa May, which seemed to satisfy investors who saw this refusal as a step away from a hard Brexit. 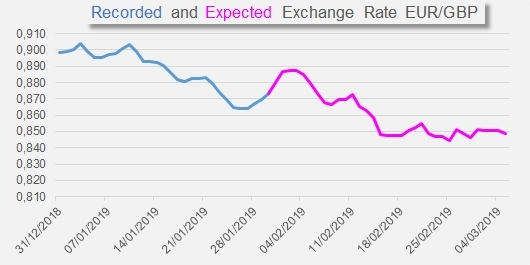 Unlike what a number of experts were expecting, it turns out that in recent weeks the British currency has recorded a notable consolidation against the euro, based on the hypothesis of a one-year delay in Britain's exit from the EU. With their subsequent vote on 29 January, British MPs expressed their opposition to a no-deal exit from the European Union and have given mandate to the Prime Minister to renegotiate the terms of separation from the EU. However, at the time of writing of this article, this latest outcome has been rejected by EU member countries, who estimate that the past two years of negotiations have definitely led to "the best possible way of insuring an orderly withdrawal of the United Kingdom from the EU". In the words of the international press, "On 29 January, Theresa took the risk of a major conflict with the European Union, and increased the danger of a no-deal Brexit just two months to the day before the date fixed for the divorce. This "no deal" would be potentially harmful for the economy of the United Kingdom and, to a lesser extent, for the economy of the continent as a whole."